The launch of the Eaton County Genealogical Society Vietnam Era Project began in the summer of 2018. Our goal is to honor Vietnam Era Veterans and create a publication when we get done with an outreach program. We have a form for veterans to fill out with the information they are willing and comfortable to share with us for the project, and another form to ask for loved ones and/or friends to fill out for those who were killed in action, who are missing in action, or who have passed away since returning home to fill out for them. We are asking that photos be sent, especially in uniform, to go with the veteran. There are multiple ways to fill out this form and send the information to us. First, download the form you need. Download the form to write your own Vietnam information. Click on the form, save to your computer, fill in the information. Click here to fill out your own Vietnam information on this form, save the form on your computer, then email the completed form, along with any photos you wish to share to ecgsvv@gmail.com. Download the form to write information for a loved one or friend. Click on the form, save to your computer, fill in the information. Click here to fill out a loved one or friend's Vietnam information on this form, save the form on your computer, then email the completed form, along with any photos you wish to share to ecgsvv@gmail.com. After you have your form downloaded and saved on your computer you can print it and handwrite the information, then bring the form to ECGS or mail it to us. After you download it and save it, you can fill in the information and save the form, then email it back to us. These are forms that you can fill in your responses directly into the form after you have downloaded the form and displayed it from your own pdf software. Use a combination of the above. Complete the fillable form, print it, and bring it in or mail it. The launch of the Eaton County Genealogical Society Military Special Interest Group began with a meeting at the 1885 Courthouse on January 19th, 2015. Fifteen people attended and indicated there was interest in continuing the group. The goal of this group is to collect information on veterans who have had any connection with Eaton County and make it available to anyone interested. As information is received and indexed, this will be updated here. There is a database, which allows you to enter a last and/or first partial name to see the information in the database we have for that name(s). If a file is available, there is a link on the file name that will open the file in a new tab. There is also a separate list that is specific indexes for a specific area, such as the Charlotte Community Library Boyd Preston Card Collection. These types of indexes will link to a file to see the original images collected. There is another list of general type of information that is not associated with names. These files can be quite large. When a file does come up, if the print is too small to read easily, please use the + feature from your reader to magnify the list. Click here for database search. If you would like to submit veteran information to add someone to the Military Database, click on this Military Form and submit it. If you have images and/or scanned copies of documents for this veteran, email them to ecgsmilitary@gmail.com. The images and/or documents will be matched with the on-line form using your email address. See our list of collected Eaton County area military organization contacts at Contact List. We know there are more. If you have contact information about any of the organizations on our list or have more organizations to add to our list, please contact us at ecgsmilitary@gmail.com..
Bellevue Historical Society Scanned from the BHS Military Collection, March 2015. One file to open; look at page number after it is open. Boyd Preston Collection The Boyd Preston Collection from Charlotte Community Library of indexed cards with information about Eaton County people, including military info.One file to open; look at page number after it is open. Ball, Daniel War of 1812 information. Boyer, Duane Korean war photos of Duane Boyer. Boyer, Laurance WWII war photos and newspaper article of Laurance Boyer. Filley, Terry M. Civil War information and widow's pension records. Fordham, Albert Civil War Pension records for Albert Fordham, filed by widow Emila Fordham, now Emila Creore. Hall, James W. Life of James W. Hall, submitted by Dave Seiter. Hyde, Harold E. Bellevue Alumni Hall of Fame for Harold E. Hyde, WWII. Photo in uniform and cemetery cross. Hyde, Lewis F. Cemetery headstone and photo of Lewis Hyde. Interview-Clyde Ray Transcription of an interview with Clyde Ray from "The War: Michigan Voices, Voices We've Heard". Army Staff Sergeant Clyde Ray was in WWII European Theatre. Interview-Earl Harmon Transcription of an interview with Earl Harmon from "The War: Michigan Voices, Voices We've Heard". Army Sergeant Earl Harmon was in WWII European Theatre. Interview-John Ross Transcription of an interview with John Ross from "The War: Michigan Voices, Voices We've Heard". Army Air Corps Staff Sergeant John Ross was in WWII Pacific Theatre. Interview-William Feasal Transcription of an interview with William Feasal from "The War: Michigan Voices, Voices We've Heard". Army Private First Class William Feasal was in WWII European Theatre. Lockett, Wm Civil War Union veteran William Lockett in Olivet Cemetery: A slave from Kentucky. Memorial Index Index of Memorial photos and indexed names. 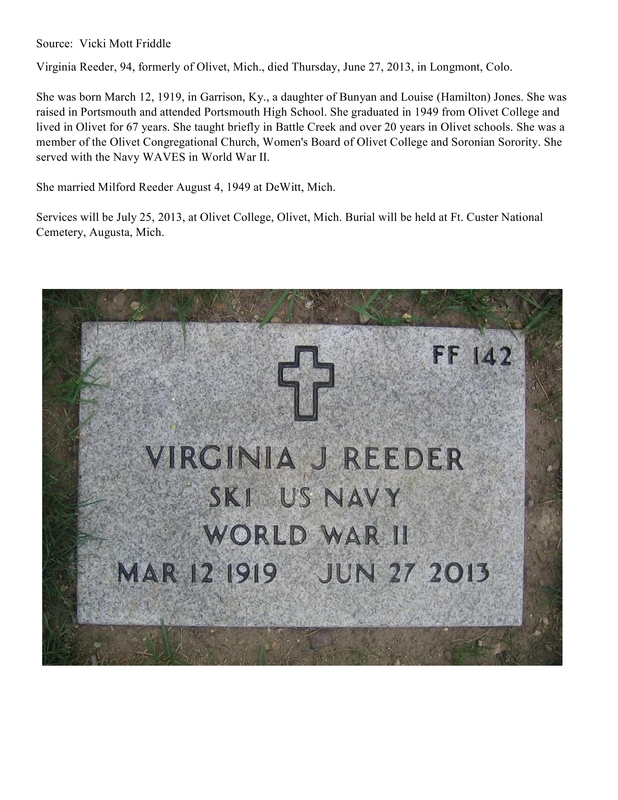 Reeder, Virginia J. WWII SKI US Navy WAVE Find-A-Grave Bio and Headstone. Williams, Thornton Civil War Union veteran: Born a slave.